Today I am entering this week's Global Design Project challenge. 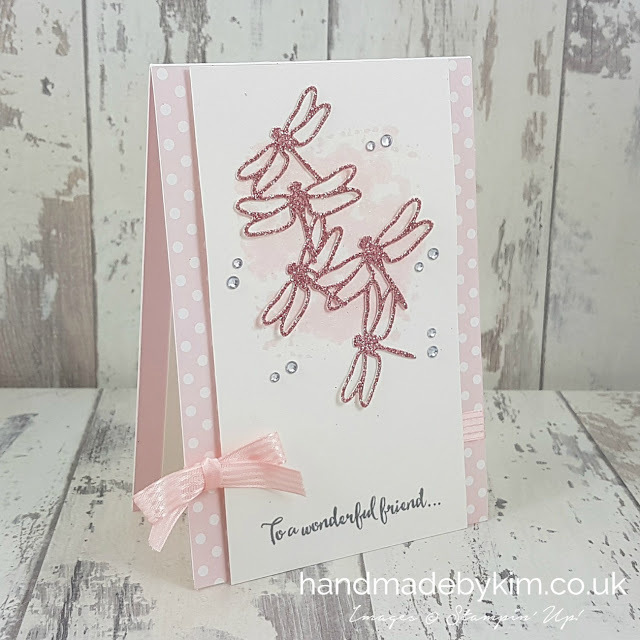 The challenge is to CASE the designer and this week's designer is Jess Williams and she has created this lovely card for us all to case. CASE means Copy And Selectively Edit (and can also mean Copy And Share Everything). 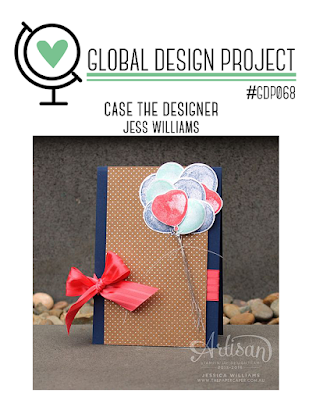 Make sure you click on the picture below to visit the Global Design Project and see what the other designers have made. I hope you can see elements of Jess's project in my designs, I love the layout and have used this layout many times, so I knew I didn't want to change that at all. In fact I have very closely followed her design when thinking about it as a sketch. As my regular blog readers will know, I love using a simple colour scheme with only one or two colours, I've chosen to use Pink Pirouette and Blushing Bride, they are such lovely colours paired with Whisper White. I couldn't help but use the Detailed Dragonfly Thinlits again for my project. They are so lovely and I really hope they go into the Annual Catalogue (make sure you get them soon in case they don't!). I created the background using a clear block and an old Wink of Stella Clear Glitter Pen refilled with water - I can't find my watercolour pens anywhere!! I picked up a bit of Blushing Bride ink with the pen and released some of the water and swished it onto the block. Sometimes things like this happen for a reason as the water contained glitter so the effect is really quite stunning. I then placed the block down onto the Shimmery White Cardstock and held it in place for a few seconds. 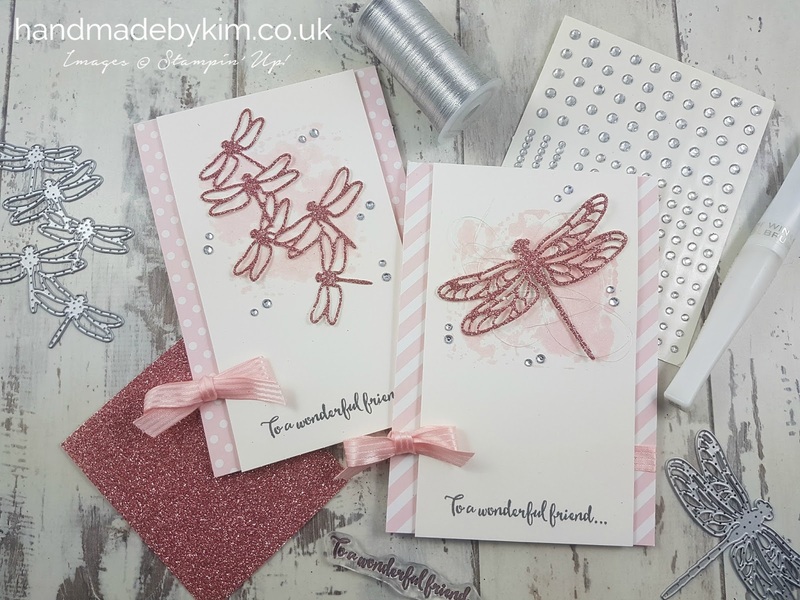 The Shimmery White Cardstock is perfect for water colouring so don't always feel tied to using Watercolour Paper, I feel this sometimes can add too much of a rustic feel to a glitzy project. 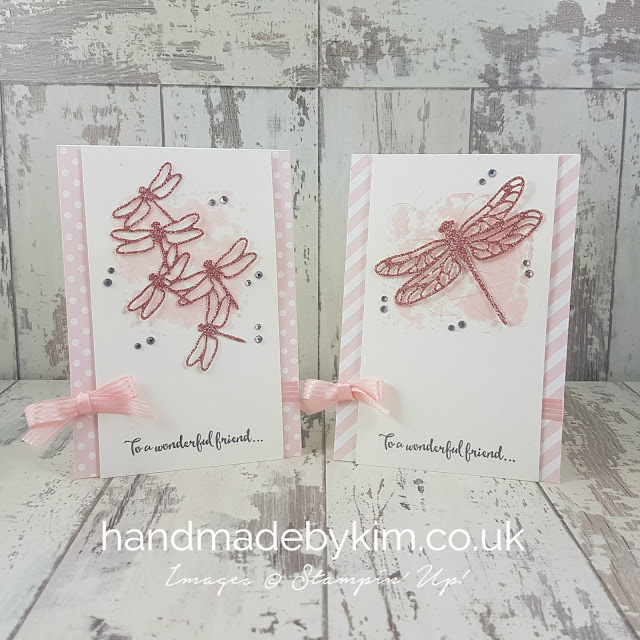 I've embellished my card with Dragonflies die cut from Blushing Bride Glimmer Paper and Blushing Bridge Stitched Satin Ribbon for my bows (they are so awful, I can't tie bows, sorry!) For the card above, I have added some Silver Metallic Thread underneath and on both cards I have added Rhinestones for some more sparkle. SUPER gorgeous Kim! I love your soft colour scheme as well as the DSP you've chosen - just so pretty! Thanks so much for joining in with the Global Design Project this week. I'm so honoured to have you CASE my card! I've used the Subtles Designer Series Paper Stack which is now being retired. 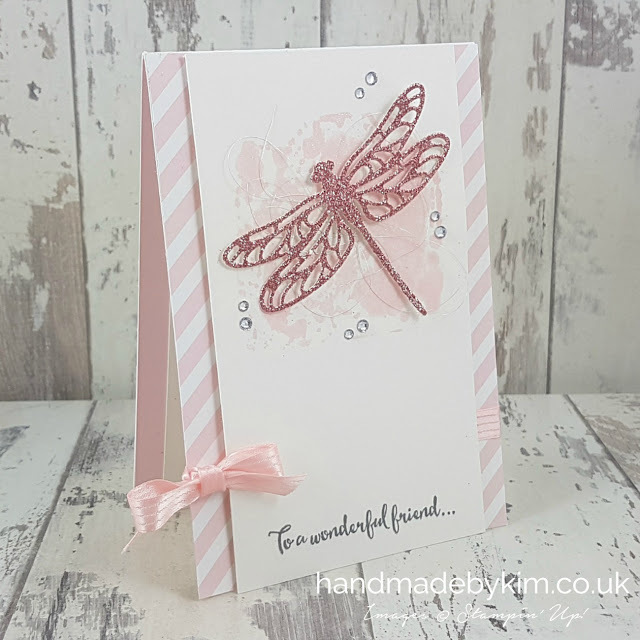 I've used Pink Pirouette for this card.